The Department for Transport (DfT) has announced £23m to ‘rejuvenate’ cycling and walking across the UK. 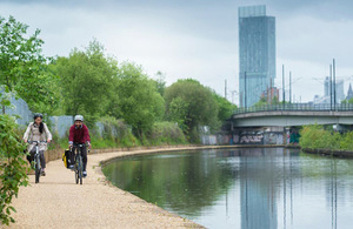 Cycling minister Jesse Norman has announced £21m to improve ‘significant’ on and off-road stretches of the 16,000-mile National Cycle Network, with a further £2m to encourage more people to cycle and walk, particularly children and young people. Mr Norman said: ‘Cycling and walking are a key part of our plans to make transport cleaner, greener and more productive. Sustrans will manage the allocation of the cash, which will fund 'dozens' of activation projects for upgrading the network that were identified in the recent Paths for Everyone report. The £2m will fund broader cycling and walking initiatives, including the Living Streets Walk to School outreach programme, which encourages young people to make walking a key part of their journeys from an early age. According to the DfT, the scheme saw walking to school rates increase by 30% last year within schools supported by the scheme. Cycling UK’s Big Bike Revival will also receive cash to continue its work inspiring the 42% of people who own bikes but do not cycle, to start riding. The Dft said it is estimated that the health benefits associated with walking and cycling on the network prevented 630 early deaths in 2017, and averted nearly 8,000 serious long-term health conditions.